Since I moved my wheel outside, I’ve noticed a surprising number of new little creatures that I probably wouldn’t normally see on my usual trip to the studio. Gekkos, Red headed skinks (a lizard), blue racer skinks, crab spiders, a rainbow of different colored dragonflies, etc., all going about their business seemingly undisturbed by my presence and the constant hum of the wheel. A great place to look for design inspiration. Saw this unusual little fellow hanging out on a loquat leaf around dusk. His/her body alone was close to an inch long. Always suspect of unusual looking bugs since moving to the south, I checked online to make sure he/she wasn’t venomous. 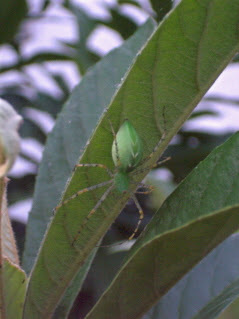 From the Dave’s Garden web site (a great gardener’s resource, btw), I learned he/she was a “Green Lynx Spider (Peucetia viridans)” that loves to eat bugs (including wasps) but is not known to bite humans. I was glad to know that since the plants in that part of my garden, especially my gardenia, have had a bit of an aphid problem the last 2 yrs. I’m always in favor of a natural predator vs using pesticides.